Being overweight is a serious health problem that's been linked to high blood pressure, heart disease, diabetes, and cancer. Recent studies show that one third of Americans are overweight. Cellfood Natural Weight Loss Formula will help get your weight loss program off to a strong, healthful start— and then keep it running smoothly. This new proprietary formula combines Cellfood with fat burners L-Carnitine and Garcinia Cambogia Plant Extract to promote healthful weight loss— even while you sleep! Decreasing fat storage by inhibiting synthesis of fatty acids and cholesterol. Increasing the body's metabolic action, transforming fatty acids into energy by accelerating the transport of these fatty acids into the cells' mitochondria. Improving the cardiovascular system by maintaining healthy HDL cholesterol (protective cholesterol), LDL cholesterol (damaging cholesterol), and triglyceride levels, keeping arteries clear, normalizing blood pressure and improving the heart muscle. The heart gets two-thirds of its energy by burning fat, so Cellfood Natural Weight Loss Formula assists the body by feeding the cardiac engine and strengthening the heart muscle. Cellfood Natural Weight Loss Formula contains Cellfood proprietary blend, L-Carnitine, and Garcinia Cambogia Extract. L-Carnitine is a potent fat burner because it is responsible for the transport of fats into the cells to be used for energy in the body. By raising the level of muscle carnitine, you support the fat burning process, and because your body becomes more efficient at processing fuel, it will increase your energy levels. Elevating carnitine will also improve physical performance by burning more fat, sparing glycogen, clearing muscle lactate, and increasing anabolic hormone response. It not only will help keep your body from storing fat, but it will increase your aerobic capacity to help you burn more calories. L-carnitine is also a great weapon for hardgainers looking to pack on muscle. Supplementing with l-carnitine can help you increase your strength and heavier weights mean bigger muscles in the long run. Garcinia cambogia extract contains Hydroxycitric acid (HCA), that blocks fat by inhibiting the efforts of citrate lyase, an important metabolic enzyme. Normally, citrate lyase converts excess sugars and carbs into fatty acids, cholesterol and triglycerides. What the body cannot use for energy, the body stores as fat, and typically this fat stores in the waist, hips, thighs and buttocks. Hydroxycitric acid interrupts this metabolic process, slowing the conversion of carbohydrates into fats, and thus halts fat storage. Garcinia cambogia's Hydroxycitric acid has the ability to suppress the appetite. Serotonin is a chemical in the brain that is a neurotransmitter that controls a number of regulatory processes, affecting appetite and mood. HCA increases levels of seratonin, and elevated levels of serotonin promote weight loss by curbing the appetite and sugar cravings. Shake bottle vigorously before using. Mix 20 drops in 8 ounces of purified water or juice, and take at bedtime. For best results, stop eating three (3) hours before taking Cellfood Natural Weight Loss Formula. Must be taken on an empty stomach. No refrigeration required. 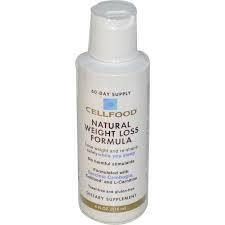 Cellfood Natural Weight Loss Formula comes in a 4 ounce unbreakable bottle, which when taken as directed will last for 60 days. • Drink plenty of purified or distilled water every day to facilitate your body's detoxification process. • Eat foods high in dietary fiber (fresh fruits, vegetables, and whole grains). • Reduce your intake of sugar, dairy, white flour, refined foods, alcohol and fried foods. • Chew your food slowly and completely for optimum digestion. • Stop eating when you feel satisfied. • Exercise at least three times per week— for a minimum of 20 minutes per session. "My sister and I have collaborated on trying to lose some weight for a long time. But we've had little success after trying many programs and products. A friend recommended the Cellfood Weight Loss to us. The results have exceeded our greatest hopes. I lost over twenty pounds, and my sister lost 16— and in less than 2 months. What impressed me as much as the weight loss was the good energy I've had since beginning the product. Usually weight-loss programs fatigue me. Having strong energy and losing weight— this is a great product." "It seemed that I'd reached a plateau in my weight and body shape that I couldn't get past no matter what I tried. But the CellfoodWeight Loss helped me lose 8 pounds and a couple of inches..... which feels like a complete miracle. There's nothing as gratifying as beginning to fit into my own clothes that I'd previously given up on. I also notice that my craving for sweets seems to have almost disappeared." "I just wanted to thank you for your new Weight Loss product. I've been using it for 5 weeks, and so far I've lost 12 pounds and 1 inch in my stomach area! One inch doesn't seem like a lot but when your tight jeans don't feel tight anymore a smile appears on my face. I still have some weight to lose but this is a great start. I have more energy too! So thank you for making this wonderful product (smile)."